If you are accepted as a participant in the beta test, you will receive an email from the Akili Interactive Labs, Inc to invite you to test "Fengo Care"
We currently support iPhones6 and higher running OS 11.2 or higher. In the Test Flight email, tap the "View in TestFlight" button. You will see a screen that asks you to accept the invitation. 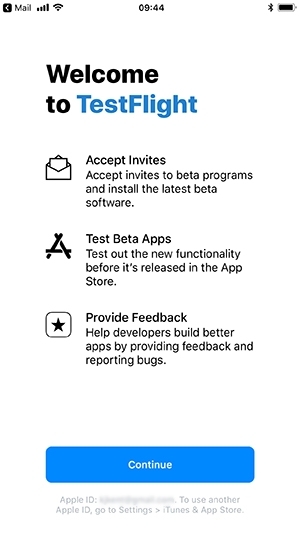 Tap on "TestFlight from the App Store"
Write down the invite code - you may need it in later steps. Touch "Open" on the "Open in the App Store" dialog box. You will be taken to the Test Flight page in the App Store, tap download icon and when it's finished downloading, tap Open. You will see the "Welcome to Test Flight" screen. Tap "Continue." You may be asked for the code you wrote down. You will see the "Fengo Care" screen within the TestFlight app. The Fengo app will start to download on your phone. Tap on the app icon and get started by signing up for Fengo. If you get stuck at anytime, send an email to support@akiliinteractive.com with a screenshot of where you're stuck. Once you complete the sign up process, begin to use the app as you normally would. How do I get the Fengo App on my Android Phone?